This website was designed with the intent to help you understand and fix problems associated with the devices listed under “Other Devices” in your PC’s Device Manager. These are the devices with a yellow question and/or exclamation mark next to them. What is the purpose the “Other Devices” section in Device Manager? What are the most common causes of “Other Devices” problems? What are the common actions that lead to “Other Devices” problems? What is the easiest and safest way to fix “Other Devices” problems? What is the purpose of the “Other Devices” section in Device Manager? Once you access the Device Manager, the “Other Devices” section should be automatically expanded for you to be able to see all the problematic devices. The “Other Devices” section of the Device Manager will only be displayed if your computer has a problematic device; otherwise you will not be able to see this section at all. 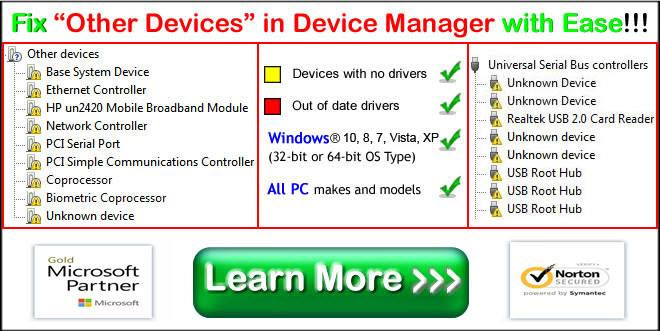 Simply put, your problem is fixed once the “Other Devices” section disappears from the Device Manager. Missing drivers – e.g. the drivers for your device are not yet installed. Incompatible drivers – e.g. your device is using a Windows XP driver on a Windows 7-based PC. Outdated driver – e.g. your driver is too old and has deficiencies. A new version is available. Wrong drivers – e.g. you accidentally installed the wrong driver for your device. Faulty drivers – e.g. there is a sudden PC registry error, or you PC is affected by a virus. You have just re-installed your Windows OS: After you re-install your OS, Windows will install generic drivers, such as the ones for mice. keyboards, CD/DVD driver, Hard Drive, but it will not install specific device drivers. For example, specific drivers for you printer, webcam, wirelless network card, and Ethernet controller may not be installed. This is the case when the main cause for “Other Devices” problems is due to missing drivers. You have just upgraded your Windows OS: For example, you’ve just upgraded your operating system from let’s say Windows Vista to Windows 7. This is the case when you may end up with some missing drivers, because Windows will only install the generic drivers. But even more likely, this is when Other Devices issues are causes by incompatible drivers. You may have the installation CD with Windows Vista drivers, but now you need Windows 7 drivers. Also, you need to check whether you are running a 32-bit OS or 64-bit OS. For example, you’ve just upgraded to Windows 7 64-bit OS, but you only have drivers for Windows 7 32-bit OS. You have installed the wrong or incompatible driver: This can either be a completely wrong driver (e.g driver for Ethernet controller installed instead or WiFi driver, but it can also be an incompatible driver (e.g. WiFi driver for Windows Vista 32-bit OS installed instead of WiFi driver for Windows 7 32-bit OS). In some cases, a device with incompatible drivers may not be listed under Other Devices. Instead, it may be listed in its category, but you will be able to still see a yellow exclamation mark next to it (e.g a webcam with an incompatible driver may be listed under “Imaging Devices” section). You have installed outdated drivers: You have an installation or backup CD with outdated drivers, or you downloaded the drivers from a website that doesn’t have the latest drivers for your device. Outdated drivers may have bugs and problems that a device manufacturer fixed in the latest version. The easiest and safest way is to use a sophisticated device repair and driver update tool. An example of such tool is SafeBytes product Driver Assist. This tool was developed with the intent to save your precious time and energy. Many PC users spend countless hours to identify device problems and to find the correct drivers, and many of them end up hiring a PC technician in the end. 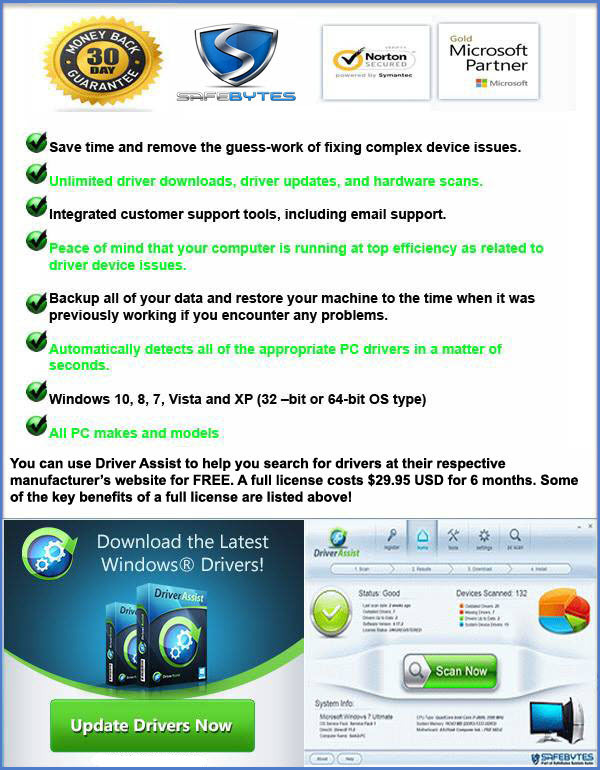 With the Driver Detective, you can rest assured that all of your PC drivers will always be up to date, and your PC will always run at the optimum performance when it comes to drivers. Also, you don’t have to worry about downloading and installing wrong and incompatible drivers, the Driver Detective will identify and find the correct drivers for all of your devices. You can experience many benefits of this tool just by running Free Device Problem and Driver Scan! Your “Scan Results” window will look similar to the screenshot below. First, we can see that Driver Detective was able to identify this PC/Laptop as Dell Insiron 1300/B130 using its sophisticated Machine Intelligence Match algorithm. 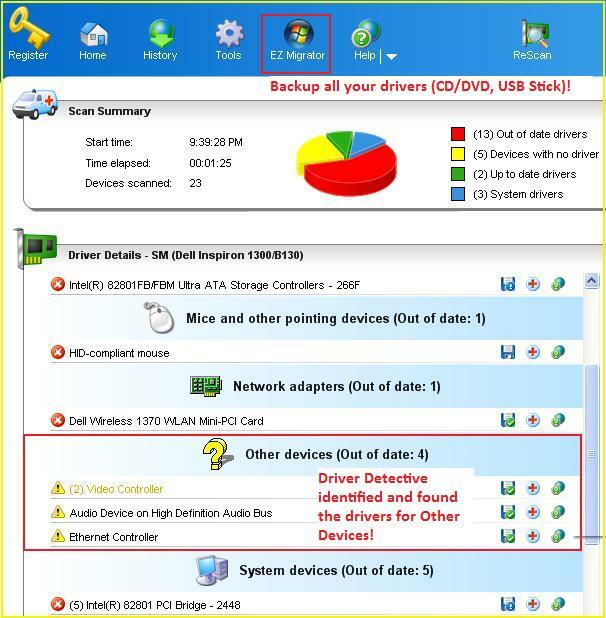 Most important, we can see that Driver Detective successfully identified four devices listed under “Other Devices” section, and on top of that it automatically located the correct drivers, which are now ready to be downloaded and installed on this laptop. More points worth mentioning are described below the “Scan Results” image. As you can see in the “Scan Results” screenshot above, 13 devices with outdated drivers were identified and their up-to-date drivers are ready for download. Some of these 13 drivers can have a significant impact on the performance of their corresponding hardware devices and on overall performance of this laptop. Imagine the time it would take to manually download the correct drivers from the websites of the manufacturers of these devices. Another point worth mentioning is the function available via the “EZ Migrator” button on the top. Ez Migrator automatically scans your PC hardware and downloads drivers for any operating system you select. So you can create a backup CD or even download the drivers to your USB stick for your existing OS. Or if you are planning to upgrade your OS from Windows XP or Vista to Windows 7, then the EZ Migrator will download Windows 7 drivers, which you can copy to a CD or USB stick and have them ready once you upgrade. That way you will be able to very quickly and effectively install drivers for devices that will appear under “Other Devices” section of the Device Manager after the upgrade. And think how handy the backup drivers on a CD or USB stick can be if your computer crashes and you have to re-install your Windows OS or a single device itself. It’s very clear, if you want to save your time and energy, use Driver Asssist.